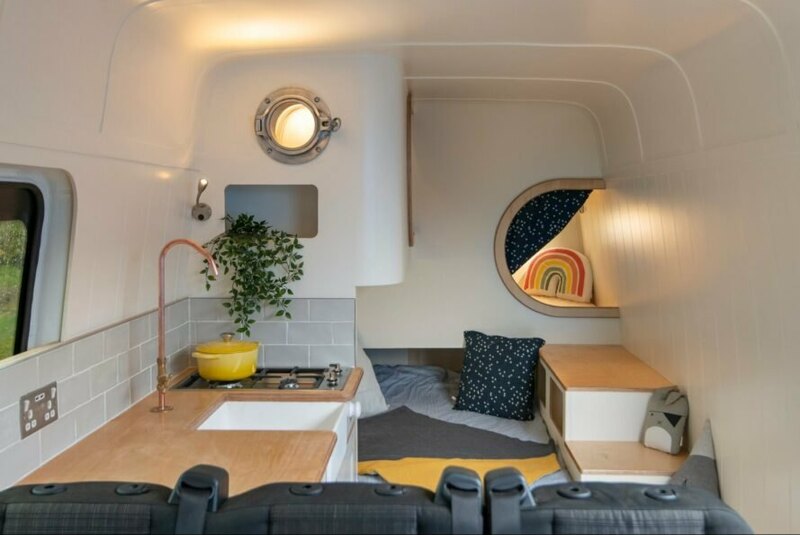 While most DIY van conversions end up as just one project, Oxford-based Jack Richens and Lucy Hedges took their passion for transforming camper vans into contemporary homes on wheels and turned it into a career. Their company, This Moving House, has just finished its sixth project, the Jubel Explorer, and it is a doozy. 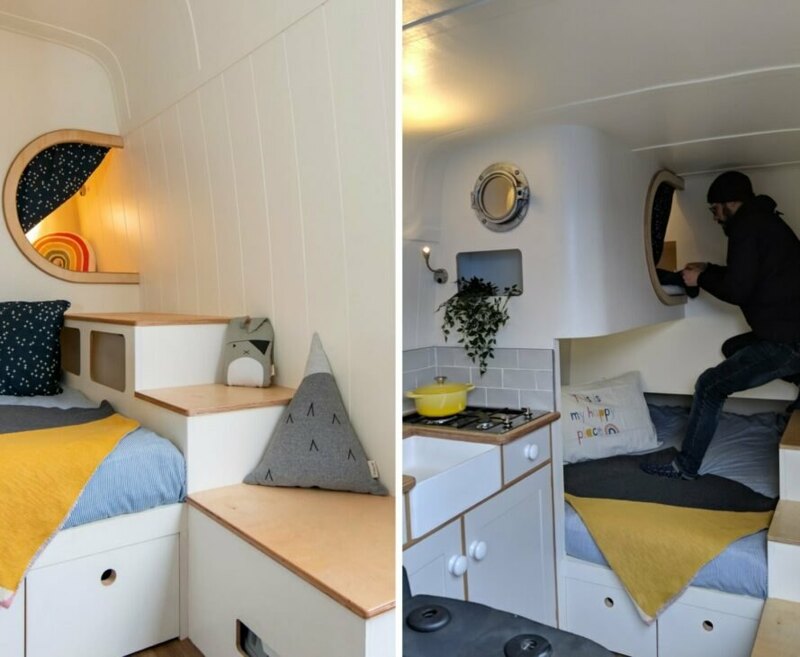 The ultra-compact space has been completely transformed into a chic adventuring vehicle, complete with two innovative sleeping nooks. Constructed on a long wheel base Mercedes Benz Sprinter, the camper van‘s revamped interior is surprisingly modern and space-efficient. 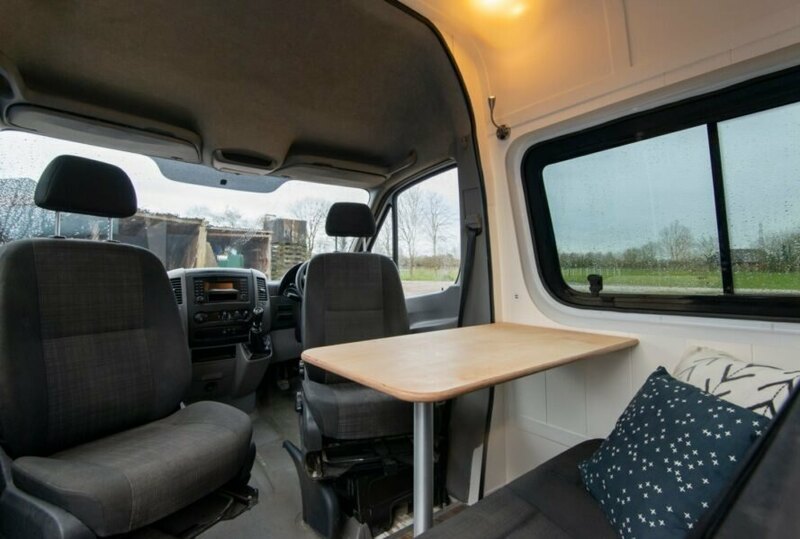 At the front of the van, the driving area has two chairs that swivel around to face a small table with a three-person bench, creating enough space for dining or working. 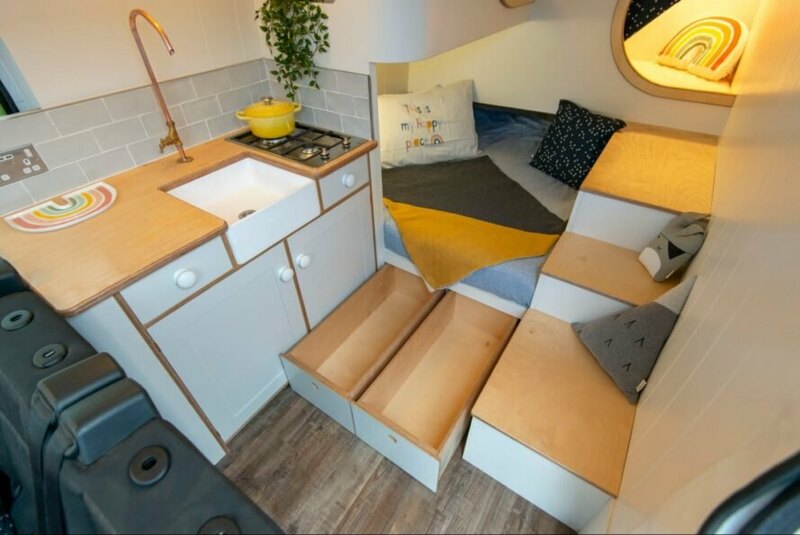 But at the heart of this incredible tiny home on wheels is the kitchen and sleeping space. Although incredibly compact, the kitchen is contemporary thanks to a palette of matte white with wooden trim. A white resin sink sits in front of a light-gray backsplash with a two-burner stove on one side and a countertop on the other. For additional preparation space, larger countertop panels folds out from the cabinetry. Next to the quaint cooking area is a day bed tucked into the very end of the camper van. Beside this bed, a simple staircase leads up to the company’s now-signature pod bunks. Accessed by porthole-style windows, the sleeping pods come complete with fixed full-sized mattress and reading lights as well as the possibility for tailored furnishings, such as a custom mattress and privacy curtains. To keep the space clutter-free, the camper van is outfitted with plenty of storage. The stairs to the sleeping pods lift up to reveal built-in nooks, and the main bed has pull-out drawers underneath. For additional storage, there is an extra-large drawer and room for gear in the back of the van. The Jubel Explorer was also made to be semi-off-grid with a diesel heater that keeps the interior space warm and cozy. Power comes from a 110AH and 12V electrical system, and the van also comes with a 21-gallon water tank. Oxford-based Jack Richens and partner Lucy Hedges turned their love of converting camper vans into a career. Designed by This Moving House, the Jubel Explorer was built on a long wheel base Mercedes-Benz Sprinter. The team completely gutted the interior before the customized interior was installed. The driver and passenger seats swivel around to a table. Space-saving techniques were installed throughout. The interior design of the camper is refined and space-efficient. A small staircase leads up to the two sleeping pods. The compact kitchen features white cabinetry with wood trim. 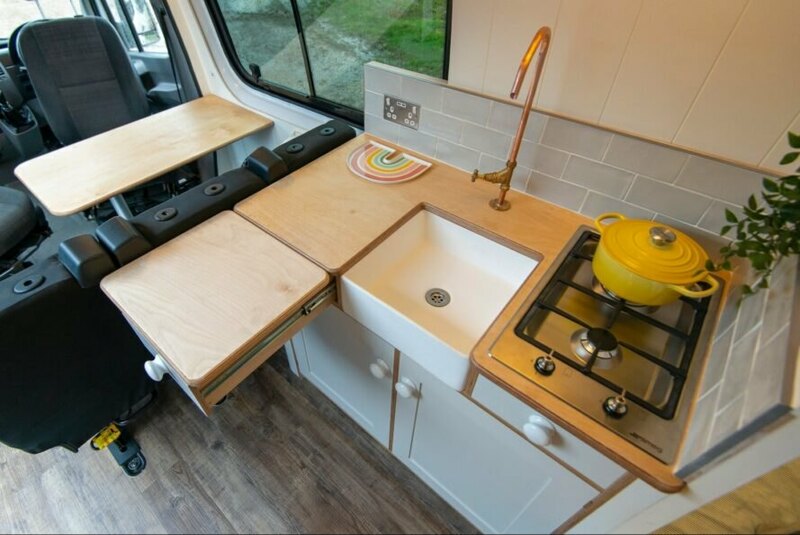 The camper van features plenty of storage, including pull-out drawers under the day bed. Storage was installed under the main bed, in the stairs and at the back of the van.